Many of the components inside electronic calculators of the 1960s and 1970s are much different to the highly integrated, miniature, surface-mount components inside modern electronic products. Here are some photographs to help identify what we might find inside a vintage calculator. 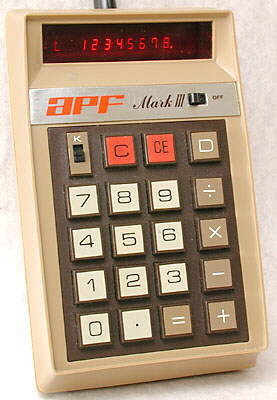 Below is the circuit board of the apf Mark III hand-held calculator, shown on the right, with component types marked. There is a key to those component types underneath. This is a dual-in-line (DIL - two in-line sets of pins), type TMS0101ANC "calculator-on-a-chip", manufactured by Texas Instruments (logo is a map of Texas with the letters 'ti' superimposed), in week 21 of 1973 (date code 7321). Two MOS-to-LED driver, integrated circuits. These are DIL, type SN75491N, manufactured by Texas Instruments, in week 35 of 1972 (date code 7235). These provide an interface between the calculator integrated circuit and the LED display. They allow the low-power MOS (Metal-Oxide Semiconductor) TMS0101ANC to drive the high current LEDs. 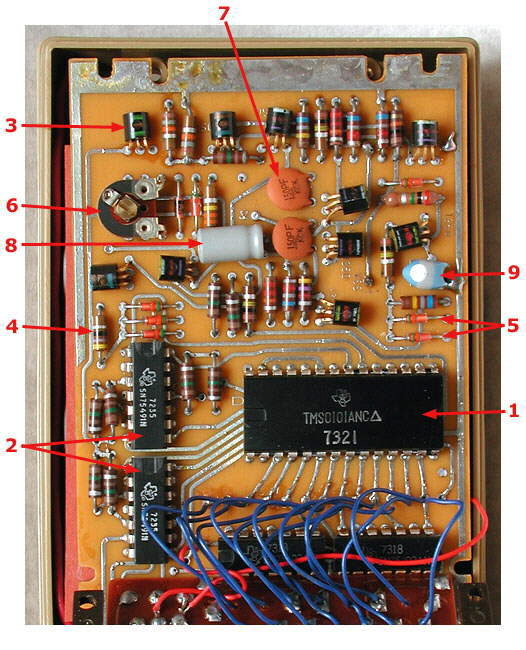 This is one of several plastic encapsulated transistors on this board. They are characterised by having three leads. One of a couple of dozen axial resistors on this board. The low-power resistors of this period are characterised by the coloured bands which indicate the resistor's resistance and its tolerance. There are several low-power diodes on this board. They are often (but not always) characterised by having coloured bands on a glass body and being smaller that the resistors around them. The variable resistor is used for setting the resistance to the required value for the circuit to operate correctly after assembly. This is a very common type with a curved track and a screwdriver-operated adjuster. There are two of these disc-ceramic capacitors, which are rugged devices providing small capacitance (in this case 150pF) at moderate voltages, which are effective at high frequency, and are very cheap. They generally have a wide tolerance - the capacitance can vary widely from the nominal value. They contain a paste which can dry out over time and alter the capacitance. If not used for some time the capacitance reduces, and then when powered up the capacitance increases as the capacitor reforms. They can have a large internal resistance which effectively reduces the capacitance at high frequencies and can lead to internal heating. They are polarised and must be connected the correct way round or they can explode when a reverse voltage is applied. Tantalum electrolytic capacitors are characterised by looking like coloured blobs with two leads coming out. They provide moderate capacitance at low voltage in a very small package, and are effective at higher frequencies than the aluminium type, but are more expensive.